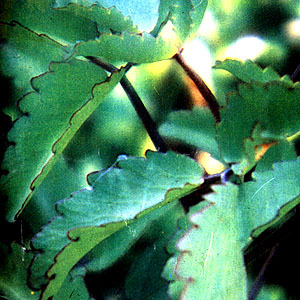 Kataka-taka – Scientific name: Kalanchoe pinnata (Lam.) Pers. A rapid growing juicy herb. Leaves are thick, fleshy and simple or compound in pairs on reddish stems. Plantlets grow along the notches of the leaf margins which can develop while still attached to the plant or when detached, a fascinating characteristic that earns its name. Flowers are about 5 cm long, nodding, dangling and bell-shaped, greenish or yellowish, reddish by the stems. Easily propagated and widely distributed in the Philippines, found in thickets and open places. Also cultivated, flowering from December to March. Probably of prehistoric introduction. This entry was posted in List of Medicinal Plants in the Philippines and tagged kataka taka on March 20, 2009 by Pinoy Herbs. your information is not complete, try to have a complete and very useful information.thanks. any information about this plant? very interesting but how kataka-taka could have roots by its leaves?? planted at my home – good for making tea . please help – can send you the photo it necessary. hmMmm. goOd thing,. anditO lang pala ang uses ng kataka-taka plant! THANK YOU! Thank you very much for the info. It really helped. What is the procedure if you have an open wounds ? and also burn? my aunt advise me to heat the leaf first. apply virgin coconut oil on the wounds and cover with the leaf. is that correct? or need to pound the leaves??? I need alternative way of medication because my mom suffer 2nd degree burn and also at her sole foot she have open wounds due to sepsis. thank you so much. Does anyone know where can I get this leaves?